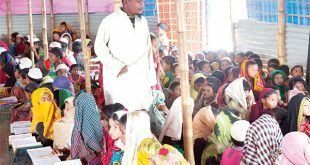 MAUNGDAW, Myanmar, June 30, (Agencies): The transit camp in Myanmar’s Rakhine state stands ready to welcome back 150 Rohingya refugees from Bangladesh every day. But on most days it lies completely empty, as members of the stateless minority dread returning to a place they were violently driven from by the military, and Myanmar makes little effort to reassure them things will be different this time. 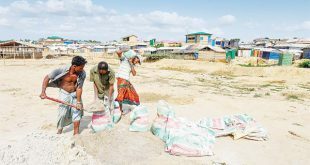 “We have been ready to receive them since January, when we opened,” said Win Khaing, immigration director at Nga Khu Ra, standing in the desolate camp with reporters on Friday as part of a two-day government-chaperoned trip to the area. The result is a stand-off, as Myanmar immigration officials wait in empty offices shuffl ing papers and arranging biometric equipment but with little to no work to do except greet visiting delegations and journalists. Fewer than 200 Rohingya Muslims have been resettled in Myanmar’s northern Rakhine state from the 700,000 who fl ed a violent army crackdown in August. Rohingya women say they were raped by security forces, while witnesses described summary executions and a merciless campaign of violence that the UN has said amounts to ethnic cleansing. Myanmar says it only targeted militants, although the military has admitted one instance of executing captured suspects. Even the limited number of Rohingya who have returned have all done so under murky circumstances. 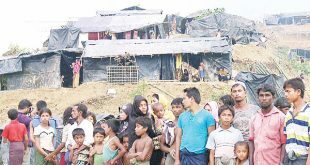 In April the government trumpeted the arrival of a Rohingya family of five, but it was later slammed as a PR stunt as it emerged they had come from a buffer area between the two countries that is technically part of Myanmar. Local authorities nevertheless created a billboard with several large photos of the family near the border, heralding the “photo records of steps of repatriation”. In recent months, Myanmar says dozens have been repatriated after crossing over from Bangladesh illegally. It says others who tried to fl ee to Bangladesh by boat but accidentally washed up back in Myanmar have also been sent to live with relatives after being processed at the transit camp. Bangladesh does not recognise these as legitimate returnees. “The repatriation process has not begun,” Bangladesh refugee commissioner Mohammad Abul Kalam told AFP. Nine Rohingya purportedly released from prison in May after crossing back over illegally were brought by Myanmar officials to meet journalists on Friday. Meanwhile, Rohingya refugees returning to Myanmar will have no explicit guarantees of citizenship or freedom of movement throughout the country, under a secret agreement between the government and the United Nations seen by Reuters. The UN struck an outline deal with Myanmar at the end of May aimed at eventually allowing hundreds of thousands of Rohingya Muslims sheltering in Bangladesh to return safely and by choice, but did not make the details of the deal public. Reuters on Friday reviewed a copy of the memorandum of understanding (MoU) agreed between the UN and Myanmar authorities. The draft also leaked out online. 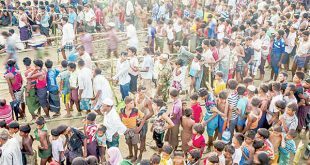 Citizenship and rights of refugees who return to Myanmar were key points of contention during negotiations over the agreement to restore access to confl ict-ravaged Rakhine state for UN agencies that have been barred since last August. The MoU states “returnees will enjoy the same freedom of movement as all other Myanmar nationals in Rakhine State, in conformity with existing. China will offer humanitarian assistance to Bangladesh to help shelter and feed hundreds of thousands of Muslim Rohingya refugees from neighboring Myanmar, the foreign minister said Friday. Wang Yi also told reporters that China hoped repatriation of refugees could begin “as early as possible,” following a meeting with his Bangladeshi counterpart Abul Hassan Mahmood Ali in Beijing. “We will contribute our efforts (to help with offering more humanitarian aids) in line with Bangladesh’s needs,” Wang said. Ali said the two had had “detailed discussions” about the status of the refugees and that he sought China’s support for the “early reparation of these displaced people back to their homeland” in Myanmar’s Rakhine state. About 700,000 Rohingya have fl ed into neighboring Bangladesh since last August to escape what United Nations and US officials have called an “ethnic cleansing” campaign by Myanmar’s government. Ali gave the number of refugees at 1.1 million. 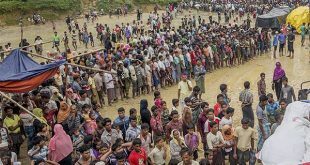 The UN refugee agency has signed a preliminary agreement for the return of the refugees with Bangladesh and Myanmar provided the conditions for a safe and orderly repatriation are fulfilled — something aid workers say still has not happened on the ground in Myanmar. 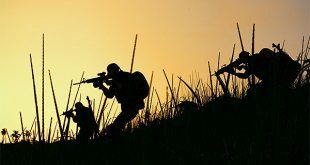 China maintains close ties to Myanmar’s powerful military and has refused to join international condemnation of the campaign of organized violence. 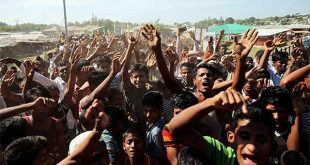 The Foreign Ministry has previously described the issue as an internal affair containing “complicated historical, national and religious factors.” Myanmar has denied Rohingya citizenship and other rights and considers them immigrants from Bangladesh, even though many have lived in Myanmar for generations.